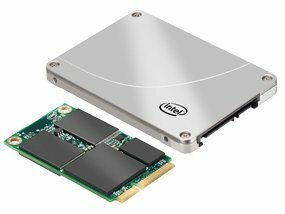 Intel introduces the SSD 313, the successor to the SSD 311 series. These new disks are available in 20GB and 24GB capacities, they are designed for SSD caching and support Intel Smart Response Technology, Rapid Start and Smart Connect. The 20 GB variant offers sequential performance up to 220 MB/s and 100 MB/s (read and write), while the 24 GB variant offers 160 MB/s and 115 MB/s, which might make one wonder about the need for a 24 GB variant, given that it's also slower at 4K random-seek performance 33,000 IOPS / 4,000 IOPS vs. 36,000 IOPS / 3,300 IOPS of the 20 GB. One reason behind the 24 GB variant's existence could be that a combination of different Intel technologies partition the SSD, taking away small amounts of capacity. The extra 4 GB of capacity might more than make up for the slightly lower performance. Both drives use SLC NAND flash chips, which are more durable than MLC NAND flash, and can take more rewrite cycles (something that factors in heavily for caching SSDs). Both drives are available in 2.5" SATA 3 Gb/s and mSATA 3 Gb/s form-factors.